Advent calendars (counting the 24 days from 1st December to Christmas day) don't really have much to do with Advent. Advent is 'coming' and much like Lent before Easter, Advent is the period in the Church leading up towards Christmas. As children it was one of our favourite church periods... less solemn than Lent, but with it's own set of traditions and services. 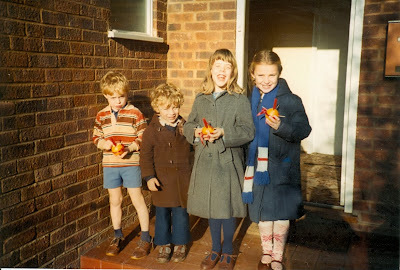 Hugely popular was the Christingle service; my brother, cousins and I would each make a Christingle; an orange with a red ribbon tied around the middle, a candle stuck in the middle and cocktail sticks with dried fruit stuck around the candle, four of them. The orange represents the world, the red ribbon the blood of Christ, the sticks (and the fruit) the four seasons and the fruit of the earth and the candle Christ as light of the world. We loved taking them down to church and lining them up on the table. In the church there was always an advent wreath; some evergreens wound into a wreath with four candles to be lit every Sunday in advent; with a fifth final candle lit at midnight mass on Christmas day. We had our own version at home - Angel Chimes. 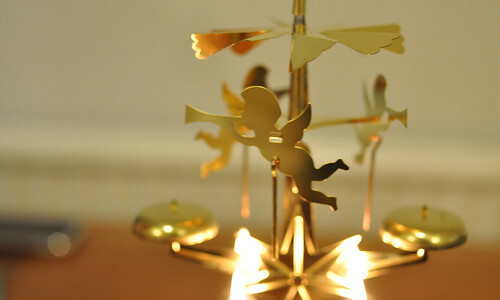 They were fantastic; little golden angels whose 'windmill' was powered by heat from candle flames; they would fly around hitting little chimes. The first Sunday in Advent they'd be quite soft and calming; by Christmas with all candles lit (and usually replaced as the originals would have burnt down) the 'tinging' would drive everybody insane until one of my parents would insist on snuffing them out. Advent Sunday isn't going to happen on 1st December again for six years; it can be as early as the last week in November.